With a new infant at home, it doesn’t take long to realize what products are at the top of the “must have” list. For many parents, a quality nursing pillow is one of those items and it is for good reason. A high quality nursing pillow can serve many functions for parents, newborns, and toddlers alike. They are commonly used to help prop up babies during nursing or bottle feeding. Additionally, they can be used as a lounger for baby to safely lay in a reclined position or used to help infants sit up on their own. Nursing pillows are also commonly used to facilitate ‘tummy time’ as your little one begins to grow. 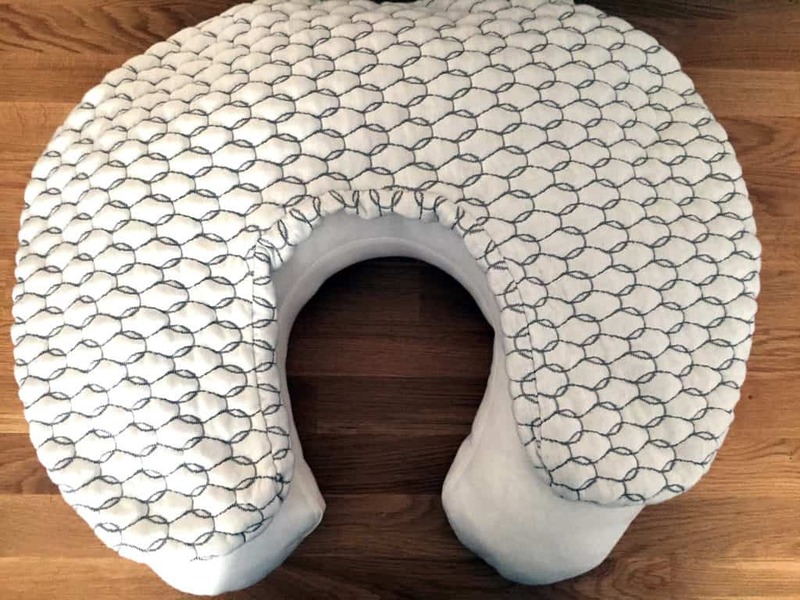 In this review of the Honeysuckle nursing pillow by Brentwood Home, we’re going to look at two main considerations- construction and usability. In addition, we’ll compare the Honeysuckle nursing pillow to the fan-favorite, the Boppy. Let’s get started. The Honeysuckle nursing pillow has a plush polyester fiberfill blend that makes up the body of this pillow, which is sewn into a cotton blend lining. The body of the pillow is then wrapped in a soft, removable bubble-quilted cover with tactile stitching. The filling itself is responsive, bouncy, and easily conforms around your body when using it. As mentioned above, a nursing pillow is a critical item for a new baby and can provide a variety of uses. When considering some of the most popular uses, this pillow performs very well. As a nursing support pillow to help keep baby in position when nursing, this pillow gets 5 out of 5 stars. It’s supportive and firm enough to keep baby at breast height, but soft and pliable enough to be able to mold the pillow around your body. As an infant lounger pillow, I’d give this a 5 out of 5 stars. It is supportive and just the right amount of give to comfortably cradle an infant. 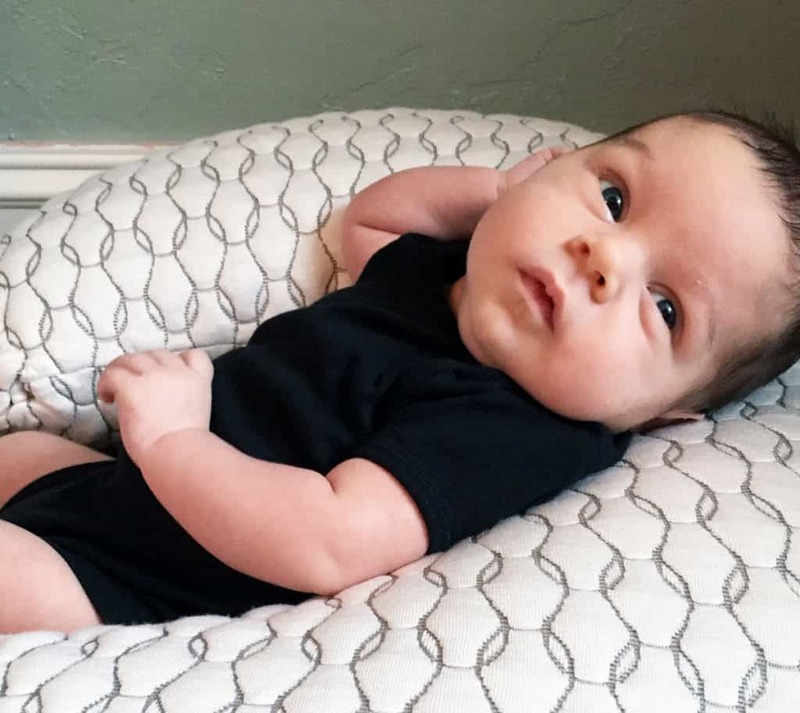 The firmness of this pillow helps to keep baby from rolling outside of the pillow or slouching into the pillow and restricting their airway. As a tummy time support pillow, this pillow gets 4 out of 5 stars. It’s very soft and comfortable against baby, but it is a little thicker than some other nursing pillows on the market. For some babies, this increased thickness might be harder to relax on top of when on their tummies. As the child gets older and can support their head and neck better, this minor issue should resolve itself. If you’ve looked into nursing pillows long at all, you are probably familiar with the Boppy– the reigning champion of nursing pillows. So how does the Honeysuckle compare to the Boppy nursing pillow? There are quite a few real differences in these similar products. From the outside, the Brentwood Home Honeysuckle nursing pillow has a removable quilted cover that gives a supple, tactile feel to the pillow- no additional cover needed. On the other hand, the Boppy is advertised and sold “Bare Naked”. For a quality looking cover, you’ll need to buy that separately. On the inside there are differences too. While both pillows use polyester fiber-fill, you can tell by the look and feel that Brentwood’s Honeysuckle pillow uses a higher quality, in my opinion. There are also additional fibers in the blend that provide added softness. The end result is that the Honeysuckle pillow feels lighter, fluffier, and more conforming around you or baby. So what’s the difference in price? The Boppy sells for $30 and Brentwood’s Honeysuckle nursing pillow sells for $50. Keep in mind the difference in quality as well as the Boppy coming “Bare Naked”. Boppy sells slipcovers for their pillow ranging from $15-$25. Considering the Honeysuckle pillow comes with a cover, the discounted price for the Boppy is a relatively moot point. Overall, the Honeysuckle nursing pillow is a great multi-purpose staple in the nursery. As a nursing pillow, an infant lounger, and a tummy time support pillow, this versatile tool is great to have on hand. It’s more expensive price, compared to the traditional Boppy, is small change compared to the higher quality product that you receive. 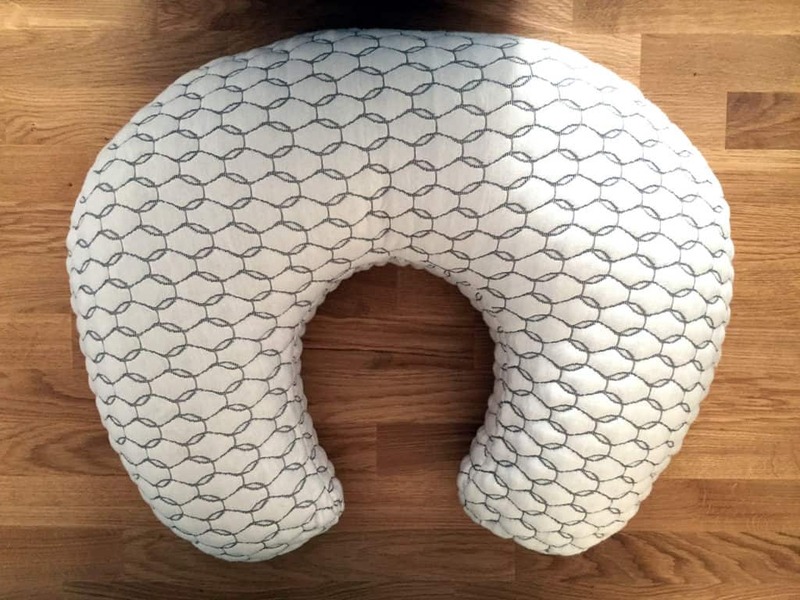 The removable, washable quilted cover helps to keep your nursing pillow looking brand new and makes it an investment that can last for years and through multiple children. For more information on the Honeysuckle nursing pillow visit BrentwoodHome.com. The Brentwood Home Honeysuckle nursing pillow strikes a nice value with a surprising level of versatility. The Honeysuckle is capable of functioning as a nursing support, infant lounger, and tummy time pillow equally as well. The materials and design are a nice step up over more traditional nursing pillows.